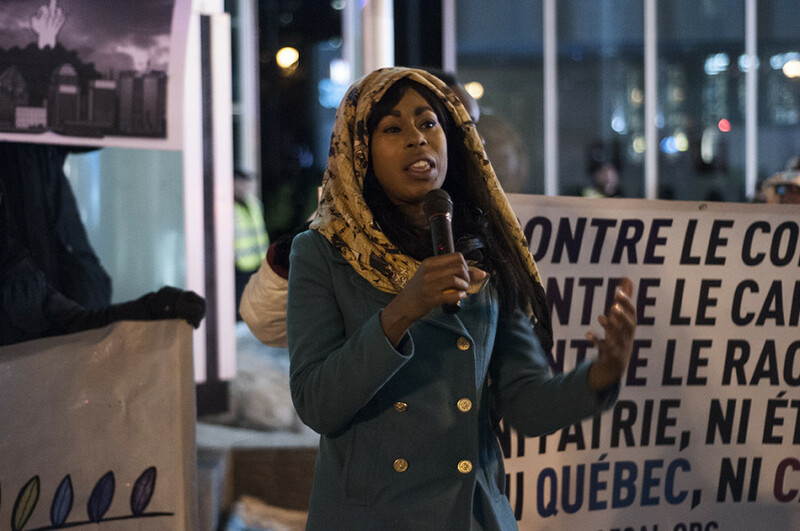 Hundreds gathered at Mont-Royal metro station Friday evening for a demonstration against “colonialism, racism and the proposed Charter of Values,” which coincided with the International Day Against Racism. The march began around 7 p.m. after speeches were given on the corner of Rivard St. and Mont-Royal Ave.
“This land we are standing on was taken from the Haudenosaunee people,” said First Nations activist Molly Swain in the first of a series of speeches during the march. She spoke of injustices toward First Nations peoples, highlighting the march’s “anti-colonialist” stance. While she was speaking, a passerby started shouting for her to speak in French and started pushing Jaggi Singh, the programming coordinator for Concordia’s chapter of the Quebec Public Interest Research Group, as he approached to try to calm him down. The crowd gathered around the man pushing Singh, ending the confrontation with him falling to the ground. “You are fascists!” he said as Swain’s speech carried on. The two-and-a-half-hour walk from the Mont-Royal metro station to the corner of McGill College Ave. and Sherbrooke St. went on without any police intervention despite being illegal according to bylaw P-6, which requires that protesters provide a route to police in advance. Protesters marched west on Mont-Royal Ave. and turned south on Parc Ave., gaining more people along the way, peaking at about 500, and then losing participants as the sun went down. “We walked without any issues and that shows the amount of political profiling by the [Service de police de la Ville de Montréal] there is,” Singh said over speakerphone as a line of police officers stood on the sidewalk as the demonstration ended. 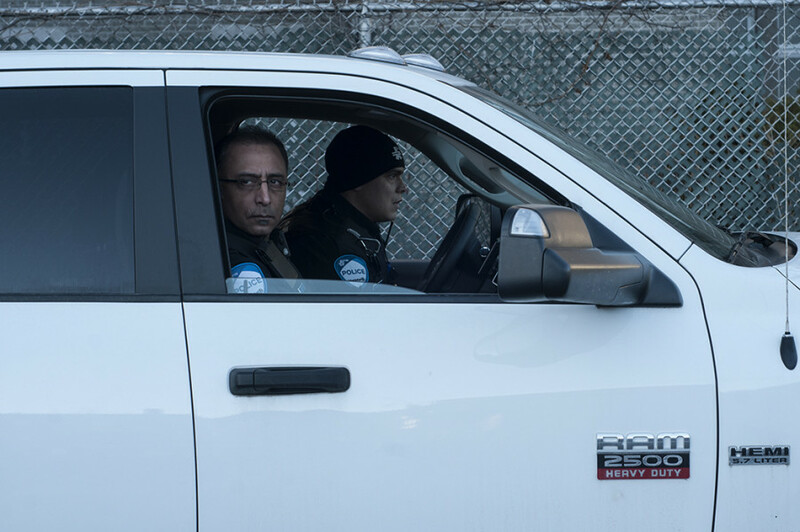 Québec solidaire MNA Amir Khadir, who is running for re-election in the Montreal-area Mercier riding, was present before the march began and said he had spoken to SPVM officers to ensure that everything would go smoothly. “I wouldn’t say the charter or that Quebec society is racist per se, but there are streams and policies that can lead to discrimination,” Khadir told The Link before the march began. The walk was hosted by Kama Maureemootoo, a member of the Qouleur Qollective, and led by Singh. It featured speeches by various organizations along the way. “We may have equal rights, but there is still a huge lack of diversity in institutions like Concordia. Why are all of our textbooks written by white professors?” Concordia student Aminka Belvitt told The Link during the protest. 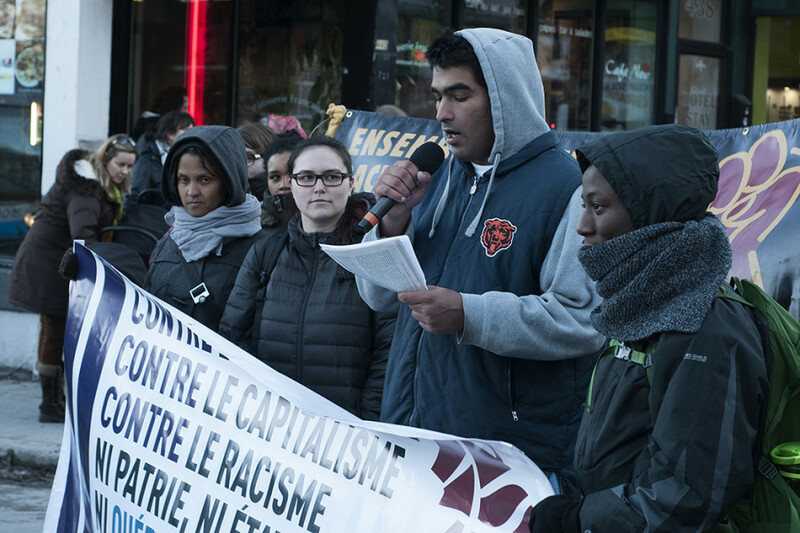 Belvitt gave a speech about institutionalized racism at the end of the march in front of Premier Pauline Marois’ downtown Montreal office on McGill College Ave.
Aminka Belvitt, a Concordia student, spoke about institutionalized racism at the end of the march. Social justice group Montreal Raging Grannies also joined protesters at the end of the walk and sang two songs—one in French, one in English, “but I’m sure you’ll understand both,” said one of the Grannies—denouncing the proposed charter of values. The demonstration was supported by a number of organizations, including QPIRG-Concordia, Solidarity Across Borders and No One Is Illegal Montreal, and commemorated the Sharpeville massacre when police killed 69 people who had been protesting Apartheid laws on March 21, 1960 in the South African township of Sharpeville. CORRECTION: This article was updated to reflect the fact that a passerby repeatedly pushed Jaggi Singh. An earlier version of this article said that the two had been pushing each other. The original version of the article also stated that the march ended in front of the Parti Québécois’ Montreal offices on McGill St. The article should have read that it ended in front of Premier Pauline Marois’ downtown Montreal office on McGill College Ave. The article also referred to Amir Khadir as the spokesperson of provincial political party Québec solidaire, although this is no longer the case. Andrés Fontecilla and Françoise David are currently the party’s two spokespeople. The Link regrets the errors.